Visually analyze your helpdesk data in ManageEngine SupportCenter Plus. Create insightful reports and dashboards. Track your Critical Success Factors (CSFs), Key Performance Indicators (KPIs) and SLAs. Analyze and track your key helpdesk metrics. Be empowered. Zoho Analytics advanced analytics connector for ManageEngine SupportCenter Plus helps you track the key performance indicators (KPIs) of your helpdesk operations. 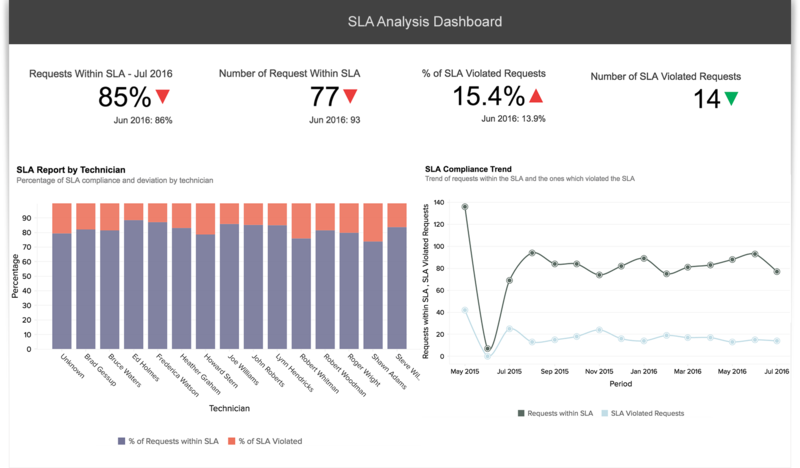 The connector pre-packages 65+ hand-picked reports on SLA, support rep performance, requests closing rate, support load in different regions, customer feedback, feature commitments, and other key helpdesk metrics. Your SupportCenter Plus data gets seamlessly synced to Zoho Analytics. Access a fully featured BI tool from within your SupportCenter Plus account. The SupportCenter Plus Advanced Analytics Connector provides you with 65+ ready made reports & dashboards, that you'll love and find great value in instantly. Visually analyze and build insightful helpdesk reports and dashboards with easy-to-use drag-and-drop interface. "Zoho Analytics has the most incredibly helpful customer support staff, compared to many other software companies I have worked with so far, by a large, large margin. Amazing service. No one else goes to such lengths as Zoho to assist their customers."